I've been kept busy lately, upgrading my studio so that I could start doing portraits. One area in particular that I felt was lacking, was a nice studio easel that wasn't too unwieldy. At first I browsed through the offerings in art supply catalogs, but ultimately decided to make one for myself. I had some scrap poplar sitting around that was intended for making artist panels, that didn't make the grade. While it isn't the best material for this purpose, it was lightweight, already in my possession, and the price was right. This was not a small undertaking. A very basic easel can be thrown together in a weekend, something with more functionality can take much longer to build. 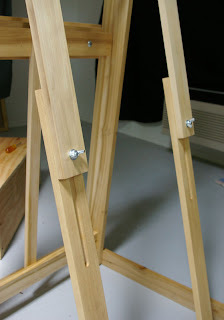 I wanted my easel to be as adjustable as commercial models, and that would require fabricating lots of moving parts. For this kind of job I would recommend at least some woodworking experience and decent basic tools. There are a lot of plans online available for easels. Ben Grosser's website was a good starting point. I used a lot of his ideas and made some changes of my own. The type of easel I built is known as an H-frame easel because of its shape. 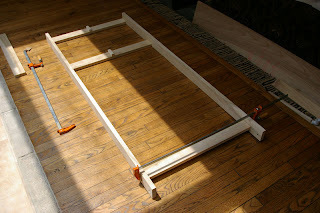 The main frame was the first piece I put together. 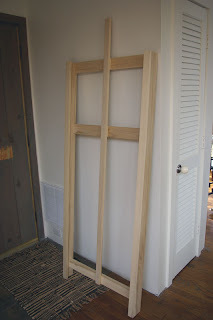 The finished frame is loosely mated to a base, and supported from the rear. 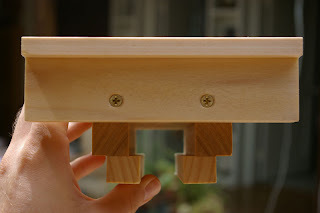 Two-piece rear support "buttresses" are hinged and adjustable, so that the frame's angle can be changed from vertical. 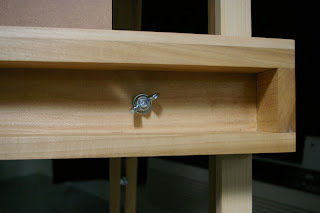 Each top support has a hole for a bolt, that can be loosened and slide along a channel routed into the bottom support. 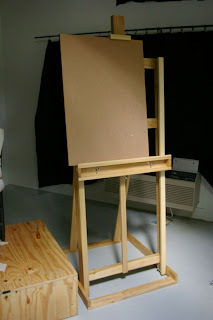 Finally, the easel must have a top and bottom clamp to hold the artwork. 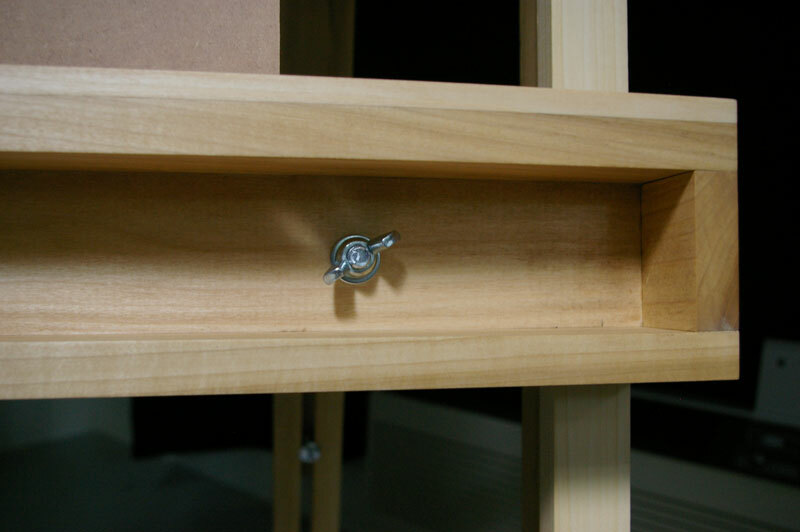 The bottom clamp locks down against the frame with bolts, onto a piece on the other side. This slides a long a channel cut in the middle. The bottom clamp, with a locknut. 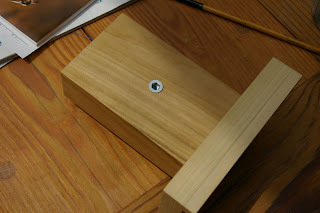 The top clamp is the final addition to the easel. It also has a channel built in so that it can slide along the middle. The top clamp viewed from the underside, showing the channel that allows it to slide along the middle. This clamp also has a threaded fitting, so that it can be locked in place once adjusted. The finished easel, in the studio, ready to make art. I am an artist - my main focus being oil painting. This blog is to document my work: landscapes, portraits, and anything else that interests me along the way. I will also cover my explorations of material and technique. Most of the work shown is available for sale. Thanks for visiting! © 2019 Zachary Kator. All images and content may not be reproduced without permission of the artist.